Gee, I wonder what these might be for. The U.S. Air Force has taken delivery of a new 30,000-pound bomb from Boeing Co. (BA) that’s capable of penetrating deeply buried enemy targets. The huge bunker buster, dubbed the Massive Ordnance Penetrator, is built to fit the B-2 stealth bomber. The Air Force Global Strike Command started receiving the bombs in September, Air Force spokesman Lieutenant Colonel Jack Miller said in a short statement to Bloomberg News. The deliveries “will meet requirements for the current operational need,” he said. If the MOP isn’t intended for Iran, what could it possibly be intended for? Of all the U.S. armed forces, the Navy seems particularly fascinated with lasers. What do you get when you combine two of the most deadly weapons out there? No, not a machete duct taped to a nuke. You get the Navy’s new gatling gun/laser hybrid. The Mk 38 Mod 2 Tactical Laser System is something you really don’t want to be on the business end of. It combines a M242 autocannon, which is a lovely piece of equipment capable of firing 175 rounds per minute, with a high-energy laser gun. An interesting idea, but I’m not sure how cost effective in terms of additional “bang for the buck”. /I mean, what increased, incremental damage is a laser going to add that the 25mm chain gun isn’t already inflicting at 175 rpm? Up and into orbit it goes, what it does, nobody knows. Although, the fact that it’s a military and not a civilian program should be a big clue. Boeing . . . today announced the successful launch of the second Boeing-built X-37B Orbital Test Vehicle (OTV) for the U.S. Air Force Rapid Capabilities Office (RCO). The OTV was launched on an Atlas V rocket into a low-Earth orbit today at 5:46 p.m. Eastern time from Cape Canaveral Launch Complex 41. “History was made in December when the X-37B became the United States’ first unmanned vehicle to return from space and land on its own,” said Craig Cooning, vice president and general manager of Boeing Space & Intelligence Systems. “The success of that mission validated this reusable and effective way to test new technologies in space and return them for examination. The X 37B: Unmanned ‘Classified’ Space Plane Launched – Why? Well, today’s Air Force launch certainly went better than Thursday’s NASA launch. Boeing will put its Phantom Ray flying wing into the air before the end of the year. Leading up to the planned December flight will be a summer schedule of taxi tests. The debut flight for the one-off prototype aircraft will be followed, Boeing said, by up to nine more flights over the ensuing six months. “The initial flights will take Phantom Ray through its paces for the flight test profile. Beyond that, the missions and systems tested will be determined by future warfighter needs,” said Craig Brown, Phantom Ray program manager for Boeing, in a statement. Looking like a boomerang with a bump in the middle, the Phantom Ray is 36 feet long and has a wingspan of 50 feet. Weighing in at 36,500 pounds, it has a cruising speed of 614 mph, or 0.8 Mach, and an operating altitude of 40,000 feet. It’s powered by an F404-GE-102D turbofan engine. Boeing is touting the UAV as an example of the ability of its Phantom Works unit to do rapid prototyping, and it’s also funding the project internally. A feasibility study took place in spring 2008, and the program got the green light in the fall of that year, the company said. 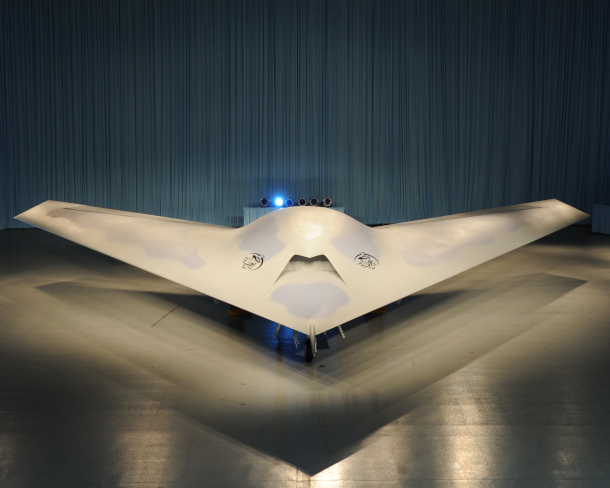 Of course, they had something of a head start–the Phantom Ray design is derived from that of the X-45C experimental aircraft, part of the Defense Department’s J-UCAS effort in which Boeing was participating. Hmmm, I wonder how much these beauties cost? The U.S. Air Force is on the verge of showcasing a new and long-sought after spaceflight capacity with its X-37B space plane, but it will do so on a space mission that’s cloaked in secrecy. What the X-37B mission truly portends is in the eye of the beholder, from a game-changing tool to hone military hardware to a provocative harbinger of things-to-come in terms of space warfare. Now ready for an Atlas boost into Earth orbit from Florida on April 20, the reusable robotic X-37B Orbital Test Vehicle (OTV) is a small space shuttle-like craft. The craft will wing its way into Earth orbit, remain aloft for an unspecified time, then high-tail its way back down to terra-firma – auto-piloting down to a landing at Vandenberg Air Force Base in California, or at neighboring Edwards Air Force Base as back-up [more photos of the X-37B space plane]. The X37-B craft was built by Boeing’s Phantom Works with the mission run under the wing of the Air Force Rapid Capabilities Office. The reusable and diminutive OTV space plane is the first vehicle since the space shuttle orbiter able to return experiments to Earth for further inspection and analysis. Its stats are modest: The vehicle tips the scales at 11,000 pounds (4,989 kg) and is just over 29 feet (8.8 meters) in length and stands slightly more than 9 1/2 feet (2.9 meters) in height. It sports a wingspan of a little over 14 feet (4.2 meters). The designed maximum on-orbit duration for the X-37B is 270 days, said Angie Blair, an Air Force spokeswoman for the project, but that flight time will be driven more by success in achieving demonstration objectives. “The X-37B is a risk reduction vehicle for space experimentation and to explore concepts of operation for a long duration, reusable space vehicle. The first flight will focus on vehicle checkout and test of subsystems such as thermal management, power control and distribution, and attitude control,” Blair said. Hmmm, I wonder what they’re up to with this? It’s too small to be of much practical use.